Karina's Kreations: Countdown to Sale-a-bration Bay 7! Countdown to Sale-a-bration Bay 7! Sale-a-bration starts tomorrow on the 28th! Yeah!!! I hope you have been enjoying my countdown. I have a super cute card to share with you today stamped by Susan Patterson. 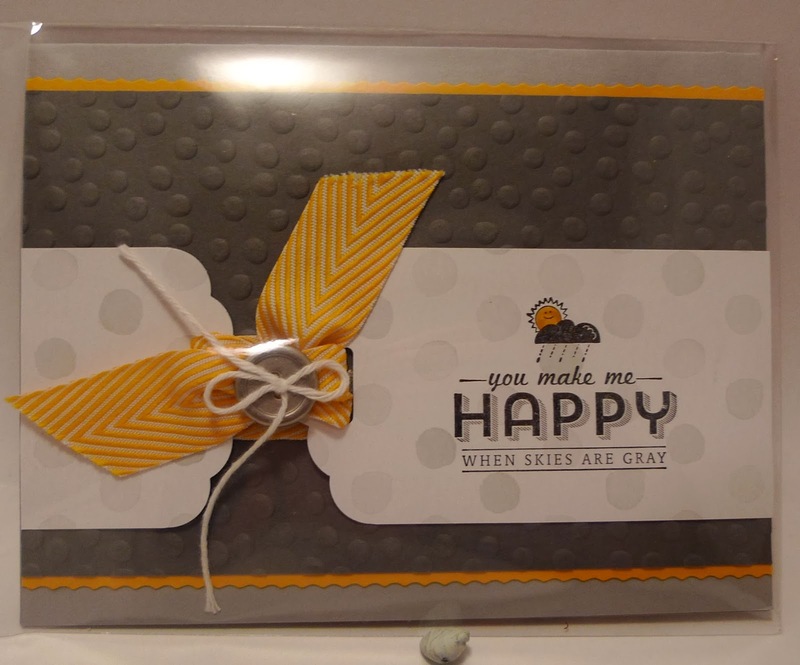 Susan makes such beautiful cards and I love how she used the new Scalloped Tag Topper punch to create a focal point for the ribbon to thread through. I love this stamp set called See Ya Later! You can get this for free with a $60.00 order. She used the Watercolor Wonder Designer Series Paper, the new Basic Metal Buttons, Crushed Curry Chevron Ribbon, White Baker's Twine & the Decorative Dots Embossing Folder. The embossing folder is a Sale-a-bration item too. I love free stuff!! !